A raw dog food recipe which is carefully thought out and properly prepared can keep Fido happy, healthy and in peak condition. 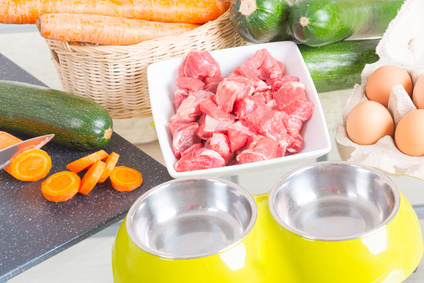 If you want to feed your dog a raw diet, you might well be wondering how to choose the right ingredients, how much to use, and how to prepare them. To get things right it's important to know the basics of what nutrients your dog needs, and of course what's safe for him to eat and what isn't. Once you've learned this, it simple to prepare tasty, healthy dishes that your dog will love... and on this page you're going to find all the tips, advice and information you need, so let's get started! But making sure that your dog gets all the nutrients he needs involves more than just throwing a couple of bones and a carrot into his bowl! Although feeding raw food doesn't involve cooking it does involve research and preparation - plus effort, creativity and patience. It's important to make sure that recipes you choose provide your dog with the right balance of nutrients for his size, age and activity level. Just like with humans, a varied diet made up of high-quality ingredients is the best way to achieve this goal. This means alternating raw dog food recipes so that your dog gets a wide variety of meat, vegetables and fruits every week. Before I get down to specifics, I thought it might help to give you an example of how to put together your dog's raw meals. Although there are a LOT of variations, you need to use some basic food groups in the correct ratio/balance each time. It's pretty impossible to balance every meal perfectly so your aim is for nutritional balance over several meals, or a few days. 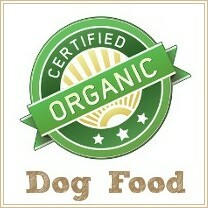 You achieve this by offering your dog a wide range of different ingredients. It's similar to the way we eat ourselves. We don't eat the same meal every mealtime, every day. Over time we eat a variety of foods and get our nutritional needs met. Feeding Fido works in the same way. And of course you can tailor your own personalized recipes to suit your dog's taste. Plenty of fresh water to drink. An adult dog needs to eat just over 2% of his bodyweight in food each day (whether it's raw dog food, or homemade food that you're cooking for him). So, for a 10lb dog that's just under 1/4lb of food; for a 50lb dog just over 1lb, and for a 100lb dog about 2.5lbs. You can use this guide to figure out how much your dog needs, but of course bear in mind that all dogs are different and that these figures are guidelines only. The bones in any raw dog food recipe should have an equal amount of meat and bone (ie a 1:1 ratio). Big bones with just a little bit of meat aren't nearly as good as smaller bones with more meat on them. Of course, the mainstay of any dog diet is a good source of protein, and for most dogs that protein is best when it comes from quality meat. 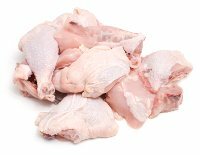 Meaty bones are an essential part of your dog's raw food recipes, but you'll also need to include raw meat, organ meat or fish instead of/as well as, the bones. 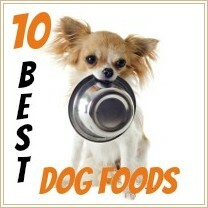 Your dog's calcium will come mostly from the raw meaty bones, so these are an ESSENTIAL . It's important to always use human-grade meat and go 'organic' with all ingredients whenever possible. All wild caught game needs to be frozen for at least three weeks before using as party of your raw dog food recipes to kill any parasites that it may be harboring. Raw salmon or trout needs to be frozen for a minimum of 24 hours for the same reason. 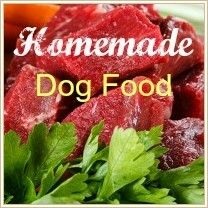 There are tons of different fruits and vegetables that you can add to any raw dog food recipe. Something worth noting here is that a dogs' digestive system can't absorb the nutrients from raw vegetables/fruit unless they are finely chopped or ground (as if when using a food processor or blender) or juiced. Lightly steaming fruits or vegetables is another way to break them down sufficiently for your dog to get the maximum benefit from their nutrient value. Like people, some dogs prefer certain ones and you will find out about your dogs' preferences as you go along. Don't be too rigid about this though as it's important that he gets a wide variety of fruit and veggies so keep trying different ones until you have a good selection that he will eat. Also, there are a few that can cause excess gas or other digestive upsets, others that are actually dangerous, even toxic, to dogs. Don't use garlic, onions or potatoes with their skin on... these can cause stomach upset and even be toxic in large quantities. Cabbage and turnips can result in a lot of gas. Tomatoes, cucumbers, mushrooms and peppers can cause tummy upsets. You can also add a number of different fruits to any raw dog food recipe. Don't use grapes or raisins. They can be poisonous to dogs. Some people like to add grain to a raw food recipe, but this isn't actually necessary because dogs don't need grain in their diet. However if you really want to do this, try adding cooked oats, barley or rice as these are less likely to cause allergies or sensitivities. 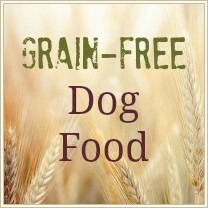 If feeding grains, it's a good idea to feed them separately from the meat due to the time it takes for a dog to digest grains as opposed to meat. Vegetables and fruits can be fed with either meat or grains. For example, you could feed vegetables and rice for breakfast and meat/bones for dinner). It's actually super easy to whip up raw dog food recipes once you have the ingredients on hand and prepared. It's almost as easy as pouring kibble into a bowl (close anyway!). Using the 75% meat to 25% vegetable/fruit ratio, all you have to do is mix the ingredients together and offer them as one meal, or divide into two and feed half in the morning and half in the evening. Obviously raw food has one big difference to dry kibble, and that is the fact that it doesn't have much of a shelf-life. Whatever isn't going to be served/eaten right away needs to be refrigerated immediately, and will be okay for 24 hours or so. After that you need to throw it away. To make life a little easier you can prepare large batches of food in one go, then divide it into daily portions (using the guidelines given earlier for the daily requirements) and freeze it. Make sure to defrost thoroughly, in the refrigerator, before serving though - otherwise you could make your dog sick. If you want to change up your raw dog food recipes, find new ideas, or just get a little extra help to make the whole process quicker and easier, there are lots of products out there that can do just that. Or, perhaps you really want to feed a raw dog food diet but aren't sure you have the time for preparation, freezing etc., there are some great alternatives out there. Some are 'complete' diets, some can be added to a diet of premium commercial dog food (replacing a portion of the meal), others can be used as the meat ingredients in a raw dog food recipe.... the choice is yours. When it comes to puppies, feeding raw is perfectly possible but it's important to pay really close attention to the nutrients and ingredients as puppies have very specific nutritional needs. If you decide to feed raw dog food to your puppy/puppies I'd suggest discussing it with your vet first to make sure that you have all the health angles covered. This article Raw Puppy Food takes a very in-depth look at feeding raw puppy food and has a ton of information, advice and tips to help you create well balanced meals for your little one. If you'd like to feed a homemade diet to your dog but prefer to actually COOK the food first, check out my Homemade Dog Food page.